Some wrongly refer these as VU meters. VU Meter is too much but these are entertaining. Volume Unit meter (VU meter) device display representation of the signal level in audio equipment, which has some of standards. We are just building a “sound meter”. You need some LEDs, couple of resistors, ceramic capacitor to build this Arduino Sound Meter. Frankly there are more easy guides with almost nothing – one Arduino board, few resistors and LEDs. Those are too less. There are ready to use Arduino, Raspberry Pi PCB with amplifier – they are too much. These are no way really accurate for scientific analysis, they will be visually correct. This kind of project basically good with ATTiny for some real thing out of breadboard. These are entertaining projects for the kids. A modified circuit with LM393 is sold as “sound sensor breakout” on online shops for $1. Which reminds more about old “clap switch” project. This Article Has Been Shared 9113 Times! 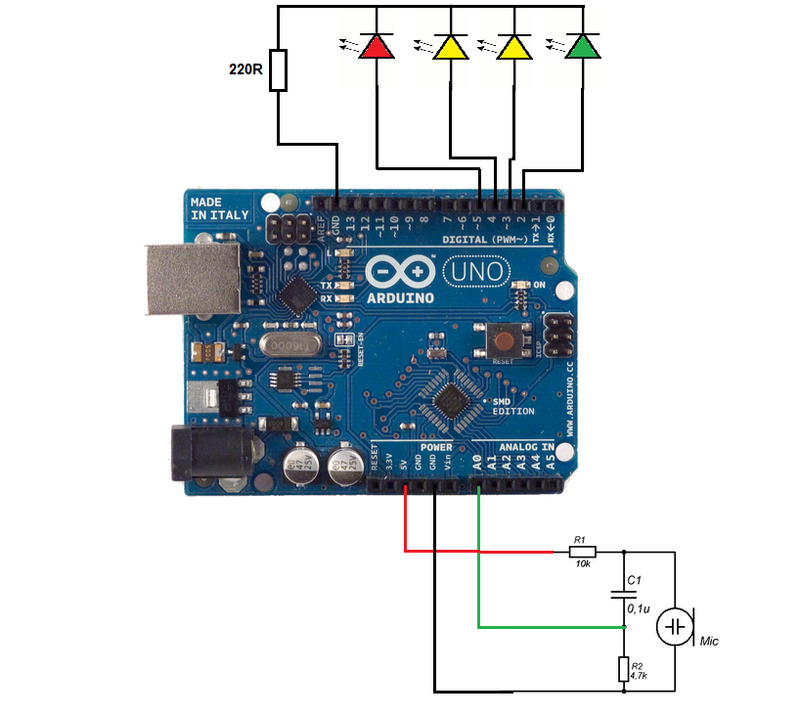 Arduino With DHT 11 Sensor and Arduino Online IDE is Example of Basic IoT Which Needs No Special Hardware But Arduino, DHT11, Internet Connection & Web Browser. We Need More Current to Run Raspberry Pi, Monitors, Sensors. Here is Guide to Setup Extra Battery, Inverter For Car For DIY Electronics Car Automation. Here is Circuit and Code to Create LED Bar Graph Progress Test Project. We Have Shown the Project With Arduino and Als Only With Components Like Transistors. Cite this article as: Abhishek Ghosh, "Arduino Sound Meter With LED : Easy But Better," in The Customize Windows, August 12, 2017, April 26, 2019, https://thecustomizewindows.com/2017/08/arduino-sound-meter-with-led-easy-but-better/.